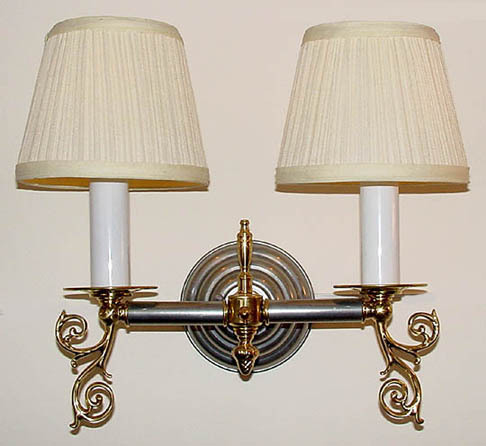 Another 'Country English' Colonial wall sconce in mixed metals. A straight arm works well here with the curled polished cast brass arm backs. Shown here with egg shell mushroom pleat fabric shade. Custom widths are no problem! Looks great in other metals like antique brass! Shown in Polished Brass and Pewter. Available in different Metal Finishes, different Glass, Back Plate, multiple arms and many other Custom Options. Width 13 In. / Projection 8 In. / Depth 11 In. Price and Measurements are for fixture configuration as shown and in the metal color shown. Shades are not included.